During a recent trip to Sydney we found ourselves in a market place in Roselle and I was fascinated by a food stall where three Turkish ladies were very skillfully preparing giant Gozleme. I say skillful because even though it appeared a very easy concept when I prepared my own I realized that the transferring of a large soft filled dough was trickier than it looked. I would recommend making smaller sizes at first or get an extra pair of hands to help you lift the filled dough to pan. So what is a Gozleme? 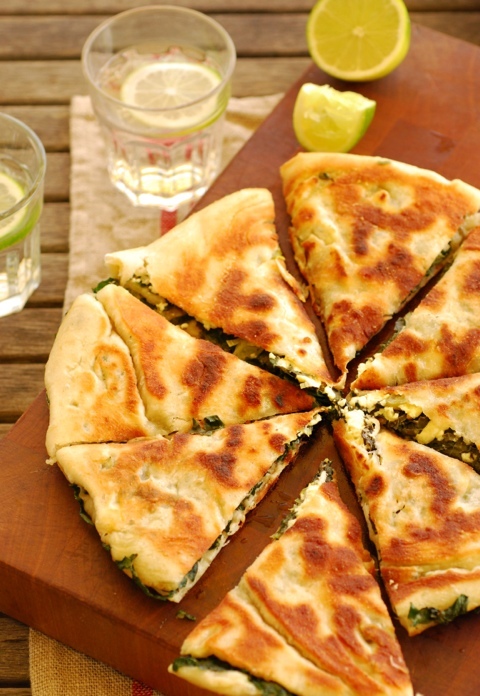 It’s a pizza like dough rolled really thinly then filled traditionally with spinach and feta cheese or spicy minced meat. Of course you could add your own fillings but I would recommend starting with the feta and spinach, or Silverbeet as I have here and build on that. We added cumin seeds and spring onions to our first one but hubby is keen for the spicy meat filling next time we make it. You will been a large frying pan, flat griddle plate or the flat plate on your BBQ. I have made round Gozleme because I was using a caste iron pan but I have given the method for rectangle because it is a little easy. Put the yeast into the well and pour the warm water over the yeast and leave to dissolve for a 2 minutes until dissolved. Stir together and knead into a soft dough and knead for 5 minutes until the dough is glossy. Divide dough into four and place each piece on a floured tray with plenty of space for dough to double in size. Cover tray with a plastic bag and make sure the bag doesn’t touch the dough. Stand in a warm place for 20 minutes or until dough doubles in size. Roll each piece of dough into rectangles so that the dough is paper thin, approx 12 x 6 inches. Divide the silverbeet, feta and spring onions into four and top half of each dough rectangle with the ingredients, feta first then silverbeet and onions. Sprinkle cumin seeds over each filling. Fold dough over to enclose filling and seal edges together. Heat a griddle or barbecue plate or caste iron pan over a medium-high heat. Place a thin layer of olive oil on the griddle and place the Gozleme on top. Cook for 2 to 3 minutes or until base is golden. Brush uncooked side of gozleme with olive oil. Turn over and cook for 2 to 3 minutes or until golden and crisp. Remove to a serving plate and cut into wedges. A scrumptious treat! Turkish food is fabulous. I will definitely be making this soon. Just used up the Spinach I picked this morning but the next batch is destined for this! Ah lucky you with home picked spinach, I have neglected my herb garden being away so often but I know hubby looks after it for me. Sydney is great, unfortunately I see more of our office and hotel room but sometimes hubby comes across and we manage a weekend surfing, dining, shopping! Wow, these look awesome. I thought they were quesadillas at first. This is even better! Alli my mouth is watering! Have printed this off to make for lunch at the weekend. Looks absolutely delicious! Hmm, that sounds and looks delicious. Will definitely be giving this a go. Yum I love gozleme! I’ve finally mastered a great gluten-free version too (after many, many tries) and always put silverbeet and feta in my filling to! Have never heard of this before but it sounds great. I have all the ingredients at the moment so will give it a go this week. For the round ones, do you divide dough into 8 and use a base and a lid? Or did this quantity make one large one in your pan, from two balls of dough, for base and top, which then served 4? Thank you. Hi Lucy, yes 8 balls makes 4 lids and 4 bases, if you want to make round ones. You roll the dough really thin, it doesn’t seem a lot at first but once you get rolling it makes plenty. Super mega yummy!!!!! I want a slice now! Looks fantastic, like a kind of a spanakopita in a yeast dough. Remind me that I must grow more silverbeet, known as chard here in Ireland. I miss the easy access that I had to it in NZ. This looks absolutely delicious! I definitely want to try it some time. Lucky you being in Sydney, you can pop down the markets and pick one up. Always nice to try making your own though. Yes! I’ve had them at a few different markets, but I would love to try making them myself sometime. This recipe looks really good! I made them! With chard and feta. Excellent! Mine were not as neat as yours as my dough was a bit of a wonky circle and not even, with some areas paper thin and almost splitting and others thicker – I need to practice! Still looked pretty good when finished though and tasted great. Thanks for introducing me to this. Wow, that looks amazing! I want this desperately! Thanks for sharing such a great recipe!